In Musashi Province at dusk on a spring day, a boatman is gathering passengers at the quay for the ferry that crosses the Sumida-gawa River for the final time that day. A traveler arrives and tells him that a crazy woman will soon come. The boatman decides to wait for her. The madwoman came to Musashi Province all the way from Kyoto to look for her child who was kidnapped by a slave trader. The boatman asks her to act crazy to amuse him if she wants to get on board. The madwoman therefore claims there is a similarity between Ariwara no Narihira and herself, while quoting the old poem “Miyakodori," in episode nine of “Ise Monogatari (Tale of Ise)." The people at the quay of the ferryboat are impressed by her speech, and ultimately she is allowed on board. While maneuvering the ferry, the boatman tells about Umewakamaru, a child who died at the opposite Shimousa-Province shore of this river exactly one year ago to the day, March 15. He asks the passengers to participate in the ceremony for the first-year memorial of his death. Although the ferryboat arrives on the opposite shore and all the passengers get off the boat, the madwoman stays on the boat and continues to cry. When the boatman asks her the reason, she reveals that the deceased child was her son, whom she came all the way from Kyoto to find. The boatman invites her to the burial mound of Umewakamaru and urges her to console the son's soul by saying nembutsu, the invocation to Amitabha Buddha, with him. The woman in sorrow regains control of herself, beats shōko (a kind of gong), and recites the invocation. Then, the ghost of Umewakamaru appears from the inside of his tomb. Although she approaches and tries to hug him, the phantom goes through her arms. Her sadness increases even more. Eventually, the horizon to the east starts to grow light, and the ghost disappears at the dawn. The mother remains crying at the mound. Women like the mother in Sumida-gawa are called “crazy women," and the noh dramas, whose protagonists are madwomen, are called “kyōjomono (drama of madwomen)." 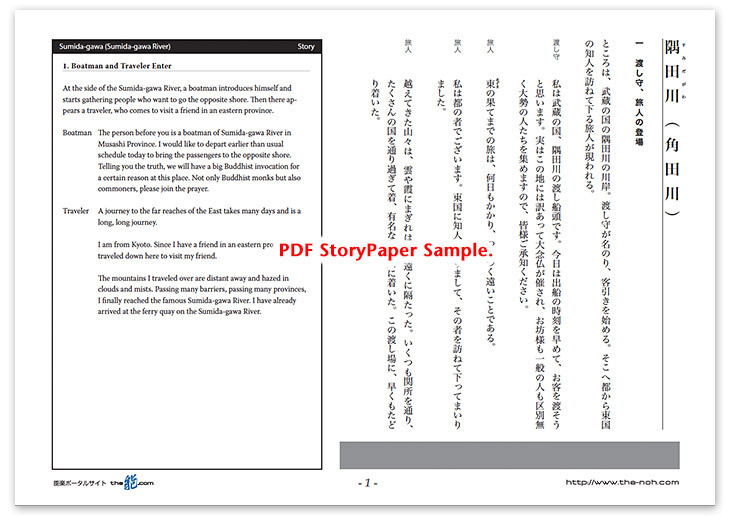 This category includes Sakura-gawa, Hyakuman, and Hanjo. The stories of madwomen dramas usually have a happy ending. In most of the madwomen stories, although a mother was torn away with her beloved, such as a child or husband, for some reason and temporarily becomes distraught because of her increasing affection, the woman meets the loved one and regains her sanity at the end. However, in Sumida-gawa, the child is already dead and the mother can only see his phantom and hear his voice. This is a representative piece of tragic “monoguruinoh (noh drama of madness)." The meticulous calculation and careful preparation of this mother and son's story induce tears for this tragic story. First, the distance from Kyoto to Sumida-gawa River is described by comparing the far-off, rural provinces with the capital, Kyoto. By using the story of traveling east in the Tale of Ise, this drama impresses on the audience how far and how undeveloped the eastern provinces and Mutsu in the far east are. The situation emphasizes the tragedy of the son, who had to die alone at such an undeveloped place, and the love and sorrow of his mother, who has come all the way to such a frontier area to look for her son. In the scene of the phantom at the ending, Zeami tried to express the ghost only by the performance of the mother, so no juvenile actor appears on the stage. On the other hand, Motomasa, the author of this drama, wanted to have a juvenile actor on the stage. It is said that therefore in their time there were two different sets of stage directions for this drama. 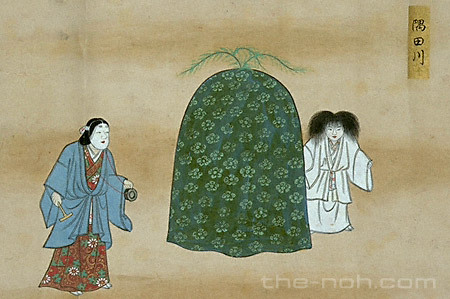 According to tradition, Motomasa tried to complete this mother-son tragedy by comparing the gallant image that the mother has from her son's living days and the appearance of the juvenile ghost who is in burial outfit with messy hair and wandering around because he cannot go to the Buddhist Paradise. This extremely sad story captivated people's heart and was incorporated into the performance of other stage arts, such as Kabuki and Jōruri at a later date.